Every week the editors at iMore carefully select some of our favorite, most useful, most extraordinary apps, accessories, gadgets, and websites. 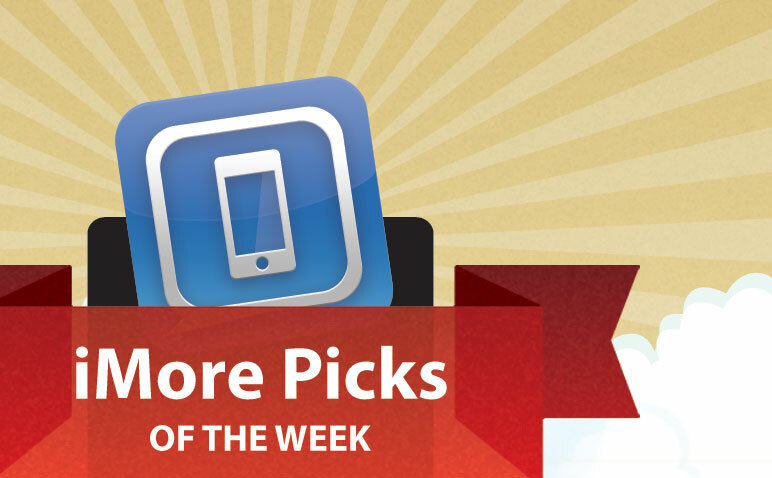 This weeks selections include a few games, a fun children's book, an app for writers, and an interesting photography app. Did you ever play Pictionary? Great party game. This is basically the same game on your phone or tablet. Notice how nonspecific I was there? That's because you can play on your iPhone, iPad, or Android phone or tablet - so you can play against your friends, no matter what they use. You're given a choice of 3 words, easy, medium, or hard. You choose the one you think you can draw, and you draw. So far so good. When your opponent's turn comes, he sees a video playback of you drawing. Beneath the drawing are some letter tiles, so he has a good chance of figuring out what you've drawn, regardless of your talent. You tap the letter and pop it into the spaces to spell out the word. You get "coins" for guessing your words, 1 for the easy word, 2 for the medium, and 3 for the hard ones. There are a few opportunities to get help. For instance, you can choose a different set of words if you can't draw any of the words you initially pull. If you can't guess the drawing, you can get rid of some of the letters so that you have a smaller pool of letters from which to choose. But your second chances are not unlimited, so use them wisely. I have a real soft spot for classic children's books as I remember them fondly from my childhood. Luckily Ladybird Classic Me Books is available in the App Store and it brings back the magic of these wonderful books. The App is a little buggy but the way the books are reproduced to look and feel like the original hard backed books I read is very impressive and you soon forgive the bugs. The titles available are excellent and includes classics like The Gingerbread Man and The Three Little Pigs. My little girl absolutely loves this app. The app costs $0.99 and for that you get one book included, the other books are all available through an in-app purchase at an additional $0.99 per book. I can't recommend this app enough if you have young children and enjoy reading to them! I've tried several writing apps on my iPad and always find myself coming back to Elements. Sometimes I just don't want to carry around my MacBook Pro but have a need to write or take notes on the go. Given I do a fair amount of writing with Markdown for iMore, I've found Elements to be a perfect combination of writing on the go and from my computer. Since it syncs all my notes with Dropbox, I can pick up right where I left off when I get back home or to the office. When you're done writing you can export to PDF or HTML, print, or email the file. Elements also gives you the option to publish directly to Facebook or tumblr is either one of those services are important to you. If you're looking for a lightweight client for anything from shared notes to lengthy articles, I highly recommend checking out Elements. I don't do much writing from my iPhone but for those that do, Elements is available as a universal binary for both iPhone and iPad. WordFoto is a neat little photography app that lets you turn iPhone photos into typographic masterpieces. It features a smart algorithm that inserts preselected words or user input phrases into any photo you've taken on your iPhone, or any image you've imported from your iTunes library. By letting you create your own unique word sets, the possibilites are quite literally endless, and the results are superb. By offering up a number of fine-tuning options like Color Tolerance, Edge Threshold and more, you can really drill down to make your photo enhanced to perfection and the word set will perfectly integrate into the image without a hitch thanks to the algorithm they've come up with. You can also choose from a number of built-in styles, including classic Gray, Comic, Black Label, Howling, Prankzter, Romance and Blocky. If you're not partial to the included styles that comes with the app, you can create your own custom style to personalize the image with absolute detail. Adjust shadowing, highlights, color saturation and image contrast, padding and even font selection. Of course, the app wouldn't be complete without social integration, so WordFoto lets you share all of your creations on Facebook or send it off to friends or family via email. Additional adjustments let you crop the image and inspect everything in great detail using zoom functionality so you get everything just the way you want it. Create amazing typographic images with WordFoto and wow your friends like never before! We had the pleasure of speaking to Michael Flarup of Robocat on the last episode of our Iterate podcast, and during the show I downloaded their Treasure Trouble for iPad game. It looked gorgeous but I couldn't exactly launch it and start playing in the middle of the show. Things got busy, as they usually do, and I didn't have a chance to check it out until last week. And yeahbutwow is it a lot of fun. The core idea is simple -- you trace paths on a treasure maps. It starts slow but builds up fast. More paths. More complicated paths. It'll challenge your eye-hand-coordination, and your multitouch gesturing skills both. And this being a pirate themed game, there might just be some drinking involved. Circadia is such a fantastic puzzle game. Each level has both colored dots and a white dot. Tapping a colored dot will emit a tone and circle who's radius grows a specific rate. Each color emits a different tone and the circles for the lower tones grow slower than the higher tones. The goal is to tap the colored dots in the right timing so that they converge on the white dot at the same time. It may sound easy, but it's actually very challenging. The levels start out pretty easy with just two colored dots and a stationary white dot. The level I'm on now (level 41) has 3 colored dots and the white dot is moving. Crazy. I know. The other thing I really like about Circadia is that it's just so incredibly gorgeous. The bright, vivid colors against a black backdrop is pure eye candy. That, and Circadia is geometric, so as a math nerd, I was instantly drawn in. Ever since I have started to take a liking to photography (mostly thanks to our own Leanna and her iPhoneography series), I've been filling up my iPhone and iPad with tons of pictures from both my iPhone 4S and my DSLR. iPhoto has a lot of really nice editing tools that allows me to make quick edits to photos on the go without having to load them to my computer first. Of course it'll never be a replacement for tools like Photoshop but it's definitely good enough for basic editing. Paired with a camera kit, I've been bringing both my camera and iPad with me when taking photos and loading them straight into iPhoto to view them with friends, family, and clients. Let's also not forget the new iPad. I am blown away with how good high quality images look on the retina display. Absolutely amazing. I still wish Apple would sync albums and events back and forth. That is my biggest complaint at this point. If I create an event on my iPad I want it on my iMac too. Hopefully we will see this functionality added in an update. If you're debating picking iPhoto up you can check out our review first. If you are a sports fan like me, March means one thing - March Madness. For those non-sports fans among us, that is the NCAA college basketball tournament. The Tournament is known for the “Bracket” – the seeding and schedule of the 64-team road to the final four. This year, there is a great app called NCAA March Madness Live, which lets me follow all the action. I can see the scores and plays in real time, follow tweets about the games, listen to game day audio and watch video highlights. If that’s not enough, I can pay a once time fee of $3.99 and watch every single second of every game right on my iPad or iPhone. This app is just amazing for the college basketball lover. The feature I like the best is that when you first set up the app (provided you did it before the tournament started) you can “fill in your bracket” and it keeps track of your winning percentage. So far, I’m doing OK – the four teams I picked for the Final Four are still in the tournament. I’d be curious to know if you are using this app and how your bracket is doing, so please head to our forums and join in on the discussion! Those were our picks, iMore Nation, so now it's your turn! Tell us your pick of the week below. Give us the name of your favorite app, site, or accessory, and tell us why it made your life more productive, more informed, more entertaining, or just plain more fun. Jump into the comments and let us know your pick of the week!